Great getaway only 2 1/2 hours from Boston , relax for the weekend fair price ! Our clean , cozy and well heated camp is surrounded by acres of woodlands, providing a great place to forget cable TV and use the spotty cell phone reception excuse for the perfect serene vacation. Rebuilt within the past ten years, this camp has shared the same foot print since first built in the '50s. Nestled on a small cove in the most northern part of the spring fed Trickey pond. Close enough to the ponds only outlet, where you can sit back at night and listen to the rushing water. A short distance from many hiking trails. Crystal clear, spring fed water that is great for swimming, paddle boating and kayaking. A great winter get away with multiple ski trails within miles. Enjoy a romantic getaway in the beautiful town of Naples with close amenities like restaurants, riverboat tours, mini golf, jet ski rentals and more. I am a simple carpenter with a life long dream to build a cabin in the woods. I was lucky enough to find this slice of paradise on Trickey pond, Then built a small and cozy camp with direct beach frontage to the cleanest pond in southern maine. LOCATION , LOCATION , LOCATION I found a slice of paradise on a great pond with no sight of any other camps or houses ! Close to town (1.3 miles) In the heart of the lakes region ! Close to many popular attractions ! Standing shower with indoor privacy window to view the relaxing water as you unwind. Beautiful updated kitchen with appliances no older than 5 years. Packed with all necessities to prepare homemade meals including cookware, dishware, as well as utensils. Full size fridge. Cozy dinning room table over looking Trickey Pond, ideal for winter dinners. Out door wooden umbrella table. Can not speak high enough praise for this place. It's clean, beautiful architecture, and has all the make ups of a great trip to fall off the grid without giving up the comforts of vacation and the connivance of location. We had a great three day weekend in mid winter. Did some snow shoeing, had a few outdoor fires, read a bunch, played cards, cooked all out meals, and enjoyed getting snowed in. A beautiful property, beautiful views, access to the outdoors, and a great comfortable getaway for two or maybe a small family. Will be back. 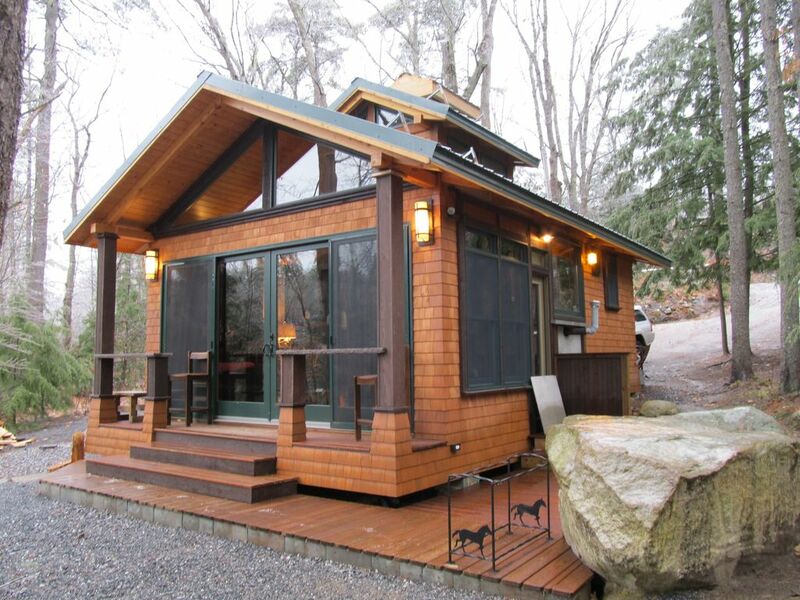 If you're trying to find a cozy cabin in maine, this is probably the place you're looking for. Skiining near by, RIGHT on the pond. Pretty ideal. My girlfriend and I stayed here in early Jan when the lake was frozen over. I'm from a place where lakes AND freezing temperatures are rare, so getting to walk out on the frozen lake was a really fun experience. A cozy getaway! The cabin was clean, well taken care of and beautiful. You will want to sit inside the whole time and stare at the incredible views and at the same time, you will want to get out and explore the lake and all of the outdoors around you. A perfect place for a couple escape- and there’s no phone service which is so freeing! We will definitely be returning. If you’re looking for a cabin in the woods with a stunning lake view from every angle of the house, this is your spot! We were looking for a place to disconnect from the hustle of everyday life and just enjoy the water, leaf peeping and each other’s company. It was very secluded with no neighbors, but close enough to the local grocery store and diners. Dave and his wife were helpful in preparing us for our trip and responded very promptly to any questions we had while we were there! Would highly recommend staying here, we will be back for sure! My wife and I enjoyed our stay at Cedarquist. It was serene and beautiful and the cabin was well appointed. Trickey pond is a true gem, one of the few with very few houses. If you are looking for a great getaway, Cedarquist fits the bill. This is a very special place! There are so many windows which brings in the beauty of the surroundings all the time. The place is very clean where it needs to be but could use a deep clean. We did not sleep upstairs as the ladder is an issue throughout the night and the mattress on main floor is not soft and gives more of a feeling of glamping. Also the driveway can be tricky. None of these issues compare to how architecturally pleasing this cabin is and that the close lake access gives my rating a 5 star. I agree with your assessment of our camp ! nice clean cabin and pond for all seasons! which is very private, no other houses can be seen! yet 3 minutes from center of town.25 minutes to drive in movies,55 minutes to north conway New Hampshire.